소방 진화와 예방의 신속한 대응과 업무 기능의 합리적인 공간을 구현하였다. 미래지향적인 입면과 매스는 경제적 측면에서 시공이 용이하도록 단순화하고 신재생에너지 적용과 냉난방기 중앙 제어로 에너지 낭비를 줄이는 등 에너지 절약형 건물로 계획하였다. 또한 운전이 용이한 설비시스템을 선정하고 자동제어 시스템을 통해 유지관리 비용을 최소화하였다. 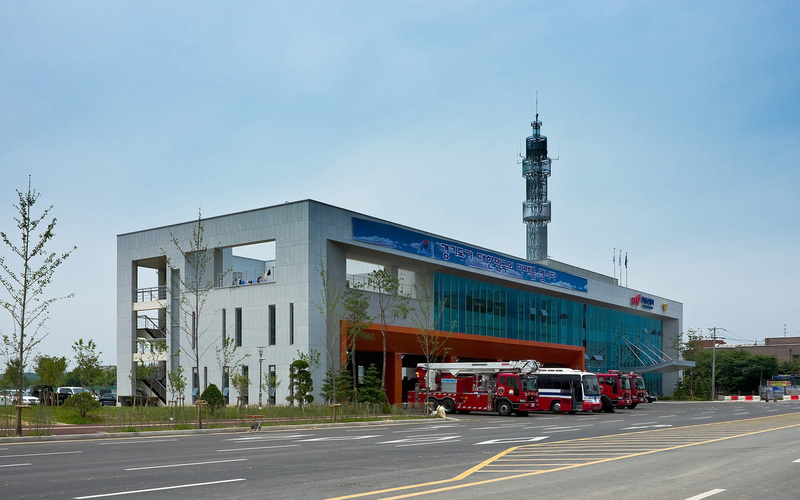 Apart from its primary requirement of providing functional space to support quick responses for fire fighting and fire prevention, design of this fire station tried to create a ‘home’. The building mass and elevations have the symbolic quality for a fire station while they are inviting and futuristic. It is also organized to ensure the firemen can be dispatched in the shortest time possible. The massing and elevations have been simplified for constructability, and the building has an excellent energy profile as it uses the renewable energy and a centrally controlled HVAC system. Other design elements, such as selecting an easy-to-operate mechanical system and opting for automatic controls and minimizing the maintenance cost.